Feeling better (been sick the last week) so decided to break out the brushes today and slap some paint. 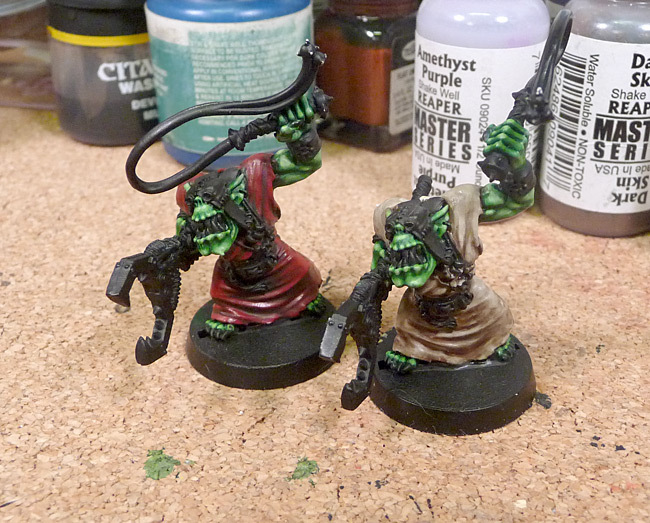 Did the robes on the two slavers – one in red, the other in a dirty tan/off white. I’ll be painting the leather hoods in appropriately contrasting colors. 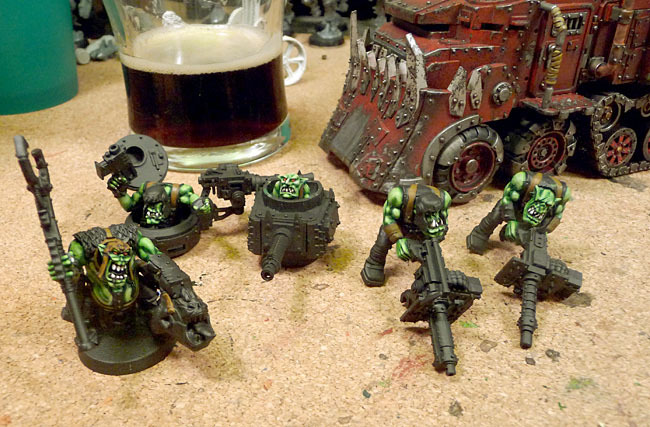 Progress will be slow(er) as I get the new hobby room sorted out and things hammered down for the Waaagh!Fest Pub Tournament coming up in July. I know, it seems like it’s a long ways away but there’s a lot to do I don’t want to wait til the last minute for anything dealing with this tournament. The trophies are in and only need them to be etched, now on to some prizes and getting the print stuff (rules, posters, etc.) generated for more publicity. 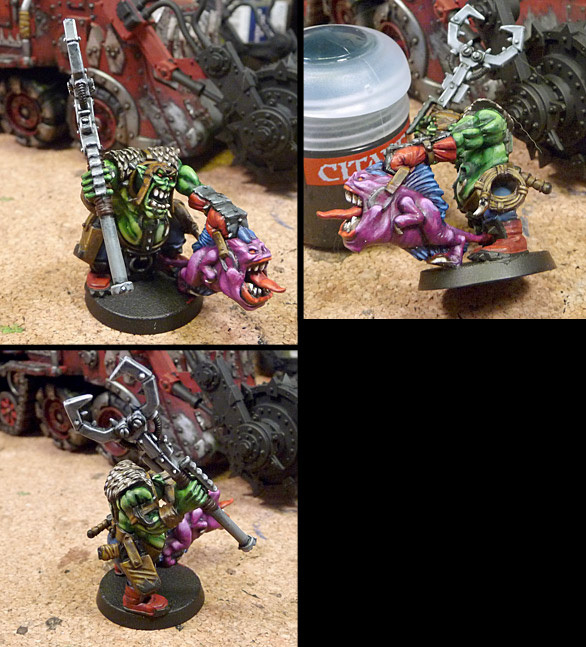 NMM Playing and Grrrrrr! Squighound with Boootiful, Kissable Lips! 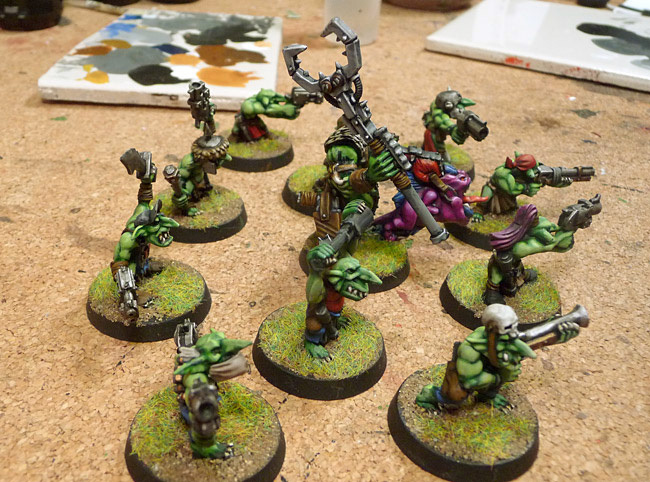 by sukigod on January, 02, 2011 in Troops - Comments Off on NMM Playing and Grrrrrr! Squighound with Boootiful, Kissable Lips! OK, this is to prove I’m not dead yet… just extremely busy in the real world with real world crap. I’m learning that my blending skills still have a long way to go and I need to push the edges of my contrast a little more. 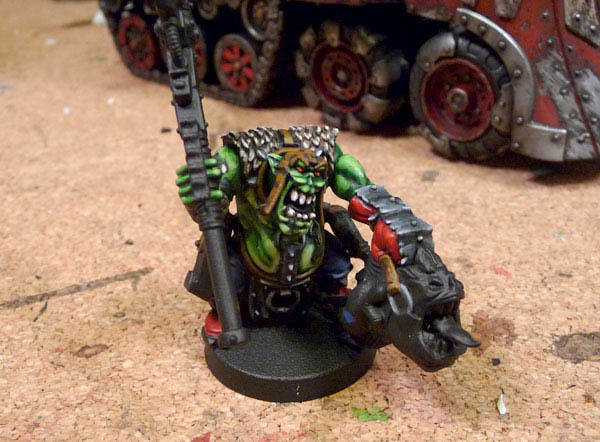 What ever though, here’s the unfinished slaver about 90% done. See, I’m not dead, just outta time for the time being. Ok, quick update – I’m not dead, just really busy. 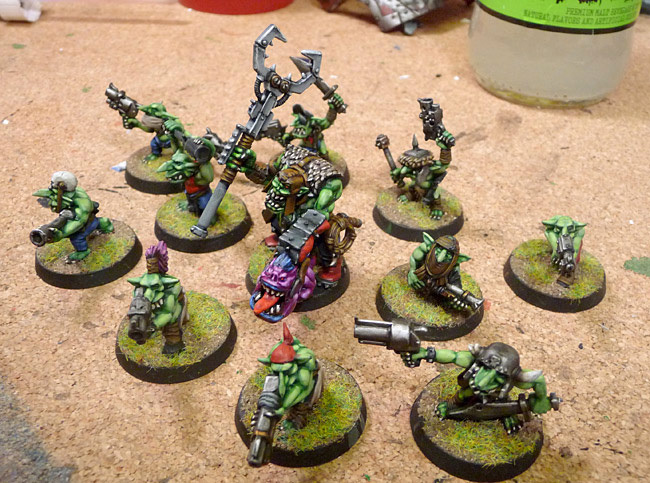 Did manage in the last three weeks to wrap up the crew for the stock battlewagon and started the runtherder for the grot mob I did a while back. 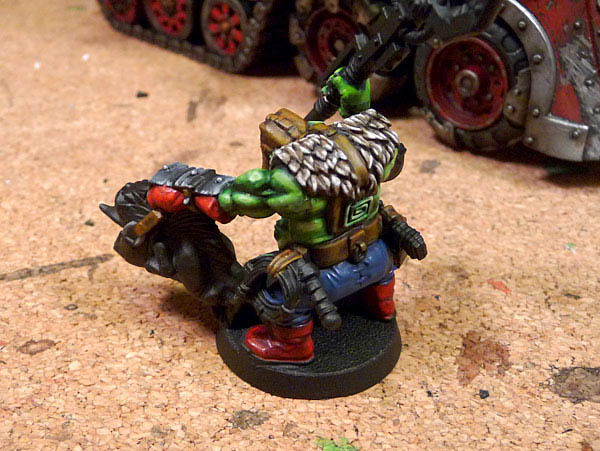 The runtherder is a really nice model with lots of detail and character, much like the rest of the new ork sculpts. Very well done GW. I’m doing him in small parts as to not go crazy trying to figure everything out at once. I’m also trying to practice a little with some NNM (non-metallics metal) and still have a long way to go. I also need to paint the deff rolla before I can call the stock battlewagon completely finished. 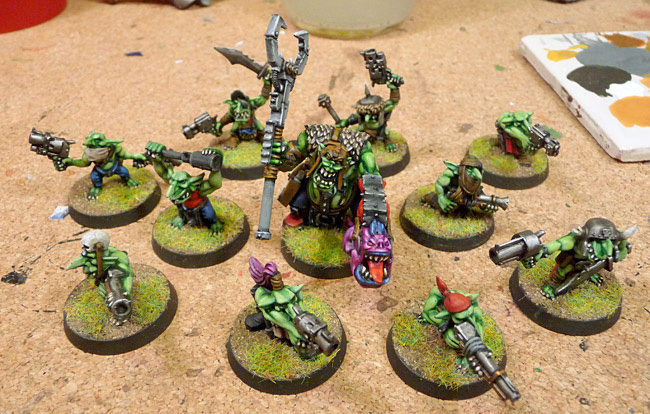 Again, not a huge rush as I’ve got very little hobby time at the moment. 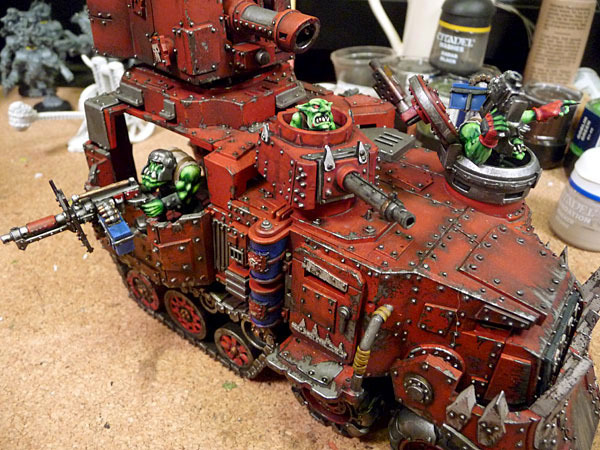 Got to work this weekend finishing up the details for the stock GW battlewagon, mainly the crew and also the Runtherder from the box set I finished a while ago. 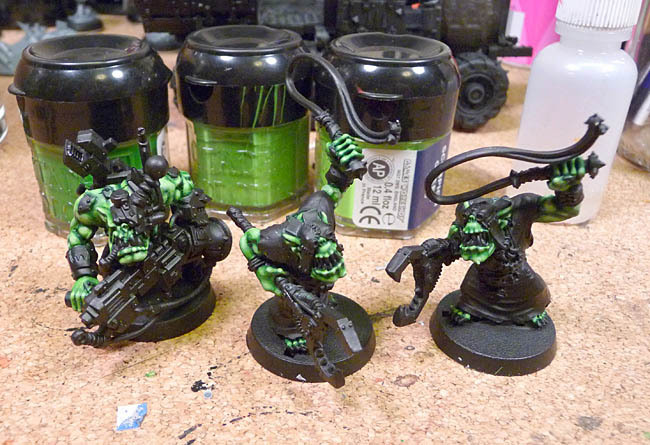 Got the skin and straps done – shirts and pants are next.